Located in Central Europe, Slovakia is a fascinating country filled with a warm culture, gorgeous mountain vistas, and stunning medieval historical sites! There’s so much to do and see in this beautiful country. Experience all 5 of these spectacular travel destinations while cycling in Slovakia. Traveling abroad creates a multitude of opportunities to experience the world in new ways. Your perspectives change through visiting different places, encountering new cultures, and undergoing extraordinary experiences you would never have at home. Cycling is a great way to offer yourself a more intimate travel experience. Watching the world go by through the window of a train isn’t as personal as taking the bike path through the striking geographical landmarks of Slovakia. From the streets of Bratislava to the peaks of the Tatra Mountains, all the way to Spiš Castle, cycling in Slovakia to these exquisite landmarks will leave you speechless. 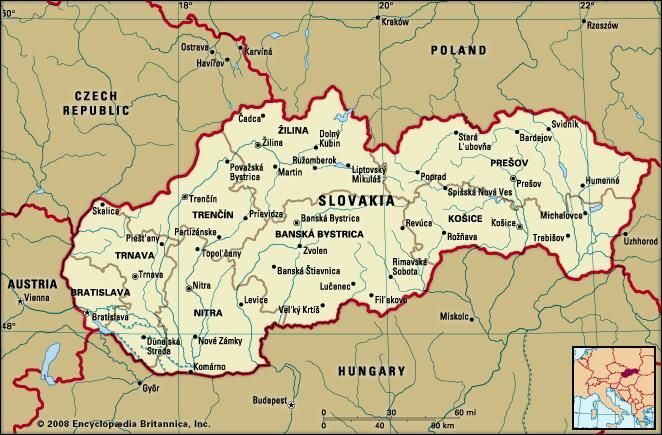 Located and landlocked in the heart of Central Europe, Slovakia is surrounded by (clockwise northwest to southwest) the Czech Republic, Poland, Ukraine, Hungary, and Austria. First and foremost, you’ll need to get yourself to Slovakia. Once you’re there, you can visit one of these amazing places on your hybrid bike! You’ll need to find a bike that suits you, whether you’re a man or woman, short or tall, thin or curvy, there’s a bike for you. After figuring out the many differences between women vs men hybrid bikes, get comfortable in your seat, and get started on your amazing journey! Here is a list of five amazing travel destinations in Slovakia to experience on your bike! You can’t go wrong visiting a castle. Located in Eastern Slovakia, the Spiš Castle region is fantastic for cycling. One of the UNESCO World Heritage Sites, this sprawling castle is one of the largest European castles in Central Europe and THE largest in all of Slovakia. The biking path goes up and around the castle, down through Spišské Podhradie, through the hills and back again. This path is noted to be a bit difficult, and spans an amazing 18 kilometers! You can also enjoy the fact that the 1996 movie Dragonheart was filmed on site here! Considered to be some of the most beautiful scenery in all of Slovakia, you’ll not want to miss cycling through Slovak Paradise National Park. Located in the Slovenský raj Mountain area, there are a few remarkable cycling paths that weave in and out of the national park. The many tours that travel from charming villages, through rocky paths, and into the conservation area of the park will leave you inspired by the magnificence of nature’s beauty around you! Be sure to check with a guide about the difficulty of some of the paths, as on a few, you’ll have to carry your bike over some of the more arduous terrains! Cycle your way through the expansive capital city of Bratislava. Here you can bike your way to many of the amazing restaurants, shopping centers, and amazing historical landmarks. Here are just a few of the stops you should make on your tour of the city! stands guard over the city. Now home to the Museum of History, you can see many breath-taking views from atop the hill! Grassalkovich Palace. A summer palace for from the 18th century, the Grassalkovich Palace now serves as the residence of the President of Slovakia. Martin’s Cathedral. A gothic church built in the 15th century is a great stop on your cycling tour of Bratislava. This church was once the coronation church for the Kingdom of Hungary from around 1563 to 1830! Primate’s Palace. This neoclassical palace is in the Old Town center of Bratislava. This palace has a unique and rich history, and now serves as the seat of the Mayor of Bratislava! Enjoy all the sites and get to know all of the amazing city sites from the seat of your hybrid bike! In Northern Slovakia rests the impressive National Park High Tatras. Home to some of the most incredible mountain views, clear lakes, and exciting wildlife. There are paths that you can use to cycle all the way around this glorious mountain range! If you’re feeling a little adventurous, and want to see the peaks for yourself, then make sure to pack your hiking boots. The terrain on the actual mountainside is difficult for your bike, but can certainly be managed on foot. Starting in Liptovský Mikuláš, a town in northern Slovakia, you can make your way to the Liptovska Mara reservoir. With the Tatras in the background, this gorgeous cycling trail will take you all the way around the reservoir. You can stop at the Celtic Havránok and enjoy the reconstructed fort with a great view of the reservoir! The Liptov region also has many shops, restaurants, and many places to rest on this long trail. The trail is paved, so it’s probably the easiest to manage on our list, but it’s also the LONGEST! Cycling in Slovakia is absolutely life-changing. From the tall mountain ranges to the bustle of the capital city, Slovakia has something for everyone to enjoy while seated on a bicycle!